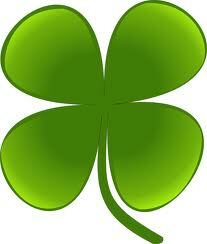 Do you have the Luck O’the Irish? Guess the amount of Cash in our Bucket O’Green and win it all! Enter in our office. Must be a current patient to enter. There are plenty of them out there. Some of them are tangible things. Others are only noticeable to those who know where to look. They can be something big or something miniscule. They are reasons to be happy! 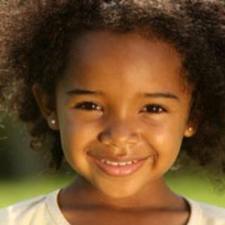 At Rampton and Defay Orthodontics we have plenty of reasons to be happy. One of those reasons is the Davis High Girls Volleyballteam. The team recently won the State Championship! We would like to congratulate them on their success. Also, Viewmont High School has found many reasons to be happy. Through different events and activities this week the students are celebrating reasons to be happy for Happiness Week. We should all be like them and find reasons to be happy! Thank you Viewmont and Davis High Schools for giving us a reason to be happy and SMILE! Remember all those habits you picked up as a youngster? Whether they are good or bad there is no denying that they stick with us for the rest of our lives. That is why it is important to teach kids the value of brushing and flossing regularly along with scheduling check-ups with the dentist. Dr. Defay and Rampton encourage you to develop these great habits if you haven’t done so already and remind you to teach your children to continue with the practice of good oral hygiene. Grand Re-opening and Ribbon Cutting. This past week we had are Official Grand Re-opening and Ribbon Cutting. It was a huge success, thanks to all who participated. Those in attendance were Mayor Hiatt of Kaysville, The Davis Chamber of Commerce, The Lakesiders and many others from the community. 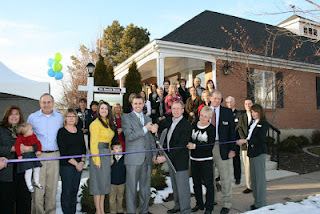 The Standard Examiner and the Davis Chamber of Commerce news featured the ribbon cutting in a couple of their articles. We are happy that we can continue to serve our community with our new look and design. We hope that as you come in you will feel comfortable and at home, just like going to the orthodontist should feel like! Have a Very Comedic Christmas! At Rampton and Defay Orthodontics, we know the Christmas season is a time to spend with your friends and family. It’s a time give. It’s a time celebrate. It’s, also, a time to laugh! 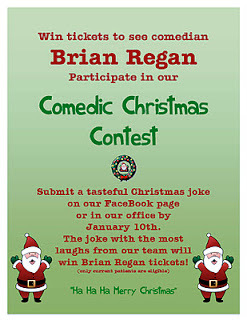 So, for our Christmas Contest we will be giving away TWO tickets to see the comedian Brian Regan. Please read the flier below for details. Here at Rampton and Defay Orthodontics, we hope you have an enjoyable Thanksgiving with your friends and family. Remember to eat the foods that won’t damage your braces. If you have anything to share with us (i.e. what you are thankful for, stories, pictures of Toothy the Turkey), feel free to post it on our Facebook page. We are having a special Thanksgiving contest at the Rampton and Defay Office. You could be the lucky winner of a $50 gift card of your choice! It is simple to enter. We have provided a picture of Toothy the Turkey on our Facebook page and in our office. Just print off the picture or pick it up from our front desk and take a creative photo with it. Then post it on our Facebook page. The person with the most creative photo will win a $50 gift card of his or her choice. The winner will be announced on our Facebook page on November 30th. Don’t Let Candy SCARE Away a Great Smile. We all know that it is very easy to get lost in those bags full of candy during this time of the year. It is important that we remember to continue brushing and flossing after we eat those sugary snacks. Also, please don’t forget to avoid those candies that can do harm to your braces. Remember that bad oral hygiene is much scarier than any witch or goblin could be. Parents, if you are worried about how much candy your child is eating, it might be a good idea to ration it over the course of a few weeks. Doing this will help avoid cavities and tummy aches. If you have any questions about how to keep your smile looking great, feel free to contact Rampton and Defay Orthodontics. It’s October! That means lots of tasty treats. 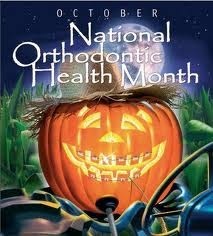 October also means it is National Orthodontic Health Month. So, be extra careful of what you are eating. Some treats may cause your teeth and braces harm. Check out the American Association of Orthodontists website to see a list of what candies should be avoided. 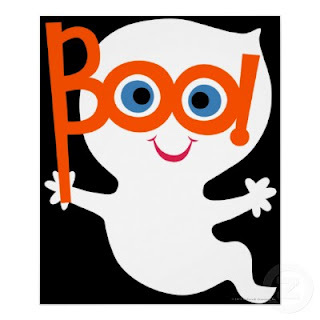 Be safe while trick-or-treating and have a happy Halloween! 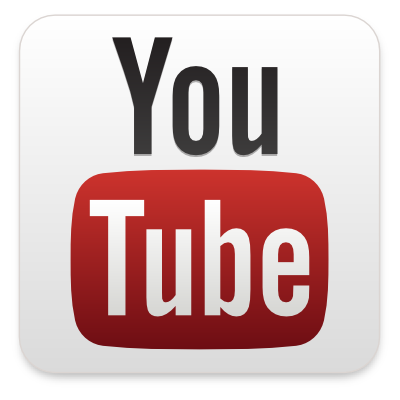 Be sure to check both our blog and our web specials pages regularly to view new and updated posts!